Researchers and the drearily uncreative folks at ScienceDirect tell us that those teens who have access to illegal drugs in the home from their parents are more likely to have tried them before those young people who do not get the drugs from their parents’ stash. 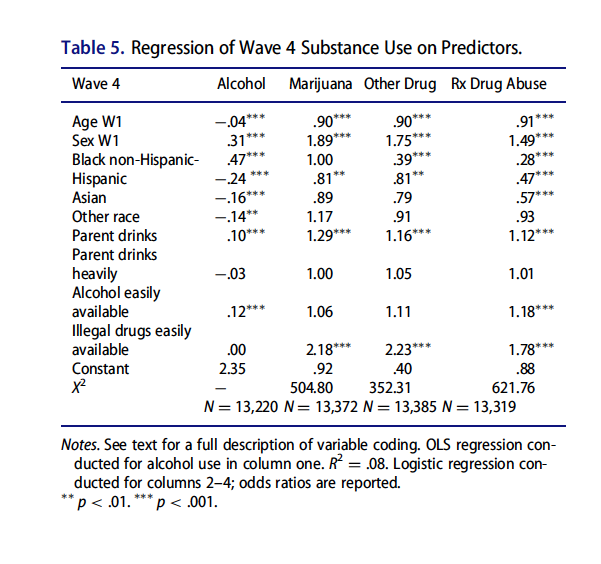 Odds ratio for using Cannabis or “Other Drugs” was about 2, meaning that people who reported having “illegal drugs easily available” in the home were twice as likely to have tried cannabis or illegal drugs compared to those who said that illegal drugs were not “easily available” in their homes as teenagers. One thing that the summary didn’t highlight is that just being male had about the same effect size: around twice. Or the abstract and paid article in this low end journal “Journal of Child & Adolescent Substance Abuse”. The journal isn’t even index by PubMed. 🙁 At least their publisher can afford a DOI subscription. They keep having to move domains, but the full article is available via Sci-Hub.